D'URVILLE - Voyage au Pole Sud et dans l'Oceanie. . . [Planche 20]. D'URVILLE, J.D. - Voyage au Pole Sud et dans l'Oceanie. . . [Planche 20]. Voyage au Pole Sud et dans l'Oceanie. . . [Planche 20]. - D'URVILLE, J.D. Title : Voyage au Pole Sud et dans l'Oceanie. . . [Planche 20]..
Map maker : D'URVILLE, J.D.. Size : 19.0 x 12.9 inches. / 48.2 x 32.8 cm. 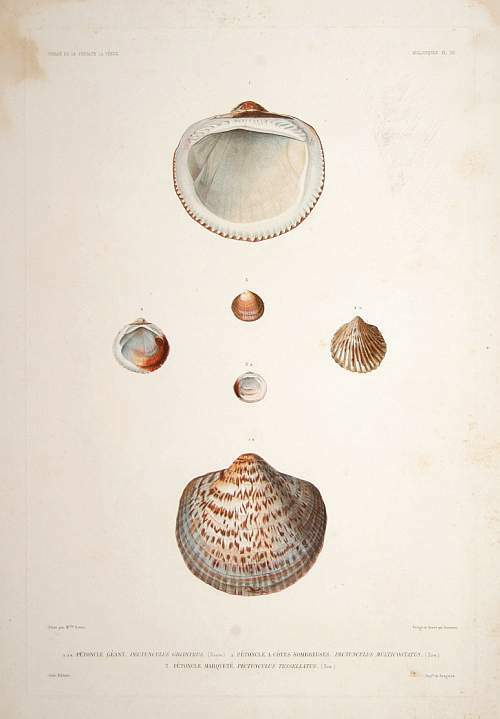 Description :"An attractive collection of shells. From Jules-Sébastien-César Dumont d'Urville (1790-1842) ""Voyage au Pole Sud et dans l'Océanie sur les Corvettes L'Astrolabe et la Zélée"". Printed in Paris by Gide et Cie.
Dumont D'Urville (1790-1842) commanded the ship L'Astrolabe's 1825 expedition in search of the remnants of the La Perouse. The ship's name was the same as Perouse's ship, which disappeared somewhere in the Pacific in 1788. D'Urville discovered the place where the former Astrolabe sank near the coast of Vanikoro, New Hebrides. A second scientific voyage took place from 1826 to 1829, in which the Astrolabe travelled in terrifying storms, ran aground six times, and miraculously escaped destruction. The ship reached Vanikoro, where a monument was created to the memory of the lost sailors, and the crew returned with the remains of L'Astrolabe and the La Perouse. Eight years later, Dumont D'Urville undertook a third circumnavigation, still in the Astrolabe, but also with the ship, the Zelee."